You forgot the best part, Komissar: make glorious televised acceptance speech using the words "I" and "me" extensively! And lie about your dog's birthday when everyone knows BO's birthday is next week. I am going to spread it around. There is a rumor going around that the First Dog pooped on the carpet of Air Force One. Bo got the blame but I think it was Michelle. [justify]If everybody gets a Nobel Peace Prize, then we at the Cube are helping to fulfill Dear Leader's vision for sharing prosperity which he mentioned in his acceptance speech. Once again Cubists are on the cutting edge. I don't know of anybody that's giving these things away like we are. In fact, I'm keeping one for myself. I am already a three or four time self-awarded recipient of Hero of Cubist Labor, and I have also been decorated with the Silver Shovel and the Golden Blogunov Award for conspicuous gallantry. Finally, there is something worthy to place around my neck! I haven't been inside a Big Lots in years, but I'll make haste to go get that ribbon. 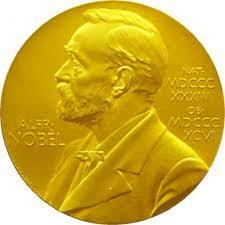 I have created a custom Nobel Prize medal. A good item to wear at the local Halloween parade. Make as many as you can and give them out. Tomorrow I'm going to upload them to Zazzle and make shirts, pins, and magnets with this design, but I'm afraid they'll reject it based on "Nobel" copyright infringement. If I spell it as "Noble" instead, some may think it's out of ignorance. What about "OBEL"? Or "NOBELLE"? Here's a link to a higher rez imagefor printing. How about Noble? The definition of noble of course implies a person of integrity, honor and duty. Ha Ha. Ironic, isn't it? Red Square, NOBELLE? Does that mean NO-BELL? Are you trying to say Dear Leader lost his COWBELL? How will he lead the herd? Say it isn't so Trapezoidal Leader, say it isn't so!?! Leninka, I think you just hit on the irony of the Nobel Prize! When I was but a cockrell, I used to spell doughnut: dognut. And the 'Noble' Prize was for valiant knights, heroic deeds, and honorable statesmanship, right? Thank Obama we all get one NOW!!! Reminds me of Donna Summers, "Ring my Bell." Maybe Zazzle will let Comrade Red Square slide on this one. Who knows? I mean, Nobel is a surname, And Comrade Red Square ought to be covered under Fair Use, i.e. parodies are okay. Let's hope so. Red Rooster - how about a Cowbell Peace Prize? Red Square - Tag Line "More Nobel." 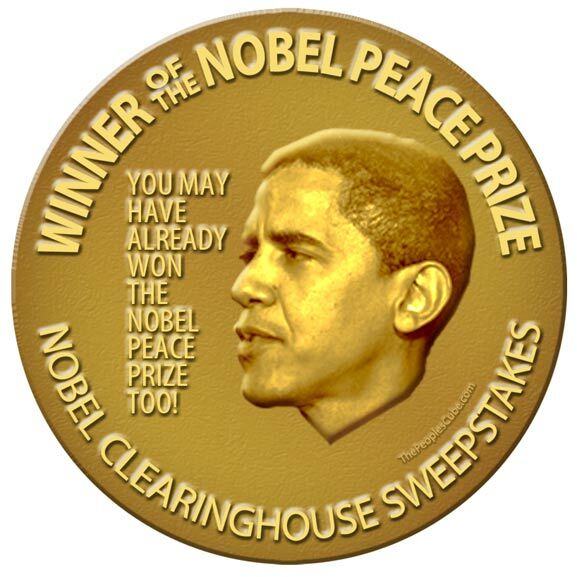 With Obama playing the Cowbell on the Nobel Medal. How about Nobel Baked Beans - Flavored with Pork - For Your Very Own Little Nobel Prize Wiener.